Plush and soft cuddle minky, Dolce Vita is a modern geometrics collection with an Italian sense of style, fashion, and on-trend colors. 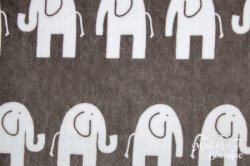 Elefante, "elephant" in Italian, is a contemporary print with elephants all in a row. 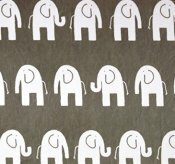 Elephants are Snow on an Oyster background. This sophisticated group is perfect for home decor. 100% polyester, 58-60" wide, 3mm pile, 370gms, machine wash cold, tumble dry low. Made in Korea.